Last Week: Meigs lost to St. Clairsville 47-6, in Rocksprings; Logan lost to Teays Valley 41-7, in Logan. Last meeting between the teams: September 9, 2016. Meigs won 25-19 in Rocksprings. MHS offense last week: 13 rushing yards, 58 passing yards. LHS offense last week: 77 rushing yards, 51 passing yards. MHS offensive leaders last week: QB Cory Cox 5-8-1, 58 yards, 1TD; RB Matthew Brown 6 carries, 19 yards; WR Zach Bartrum 3 receptions, 50 yards. LHS offensive leaders last week: QB Brady Walsh 10-24-1, 12 yards; RB Preston Yates 15 carries, 43 yards; WR Landon Little 6 receptions, 50 yards. MHS defense last week: 261 rushing yards, 132 passing yards. LHS defense last week: 113 rushing yards, 80 passing yards. 1. This is the 18th all-time gridiron meeting between the Marauders and Chieftains. LHS holds a 9-7-1 advantage in the series. Meigs last defeated Logan in 1981, by a 14-0 final. 2. Prior to last season Logan had defeated Meigs in three straight attempts. The Marauders last trip to LHS was on September 11, 2015, when the Chiefs won 27-22. 3. So far this season, Logan has allowed five rushing touchdowns and four passing scores. In addition, LHS allowed three special teams touchdowns last week. The Marauders have surrendered eight touchdowns through two games, four passing and four rushing. 4. Through the first two games of the season, Meigs is scoreless before halftime. The Marauders have held opponents scoreless in the first quarter, but have been outscored 42-0 in the second period. 5. This is Meigs’ first road game of 2017. The Marauders were 2-3 away from Meigs County last season and Meigs has gone a combined 13-11 on the road in the head coaching tenure of Mike Bartrum. 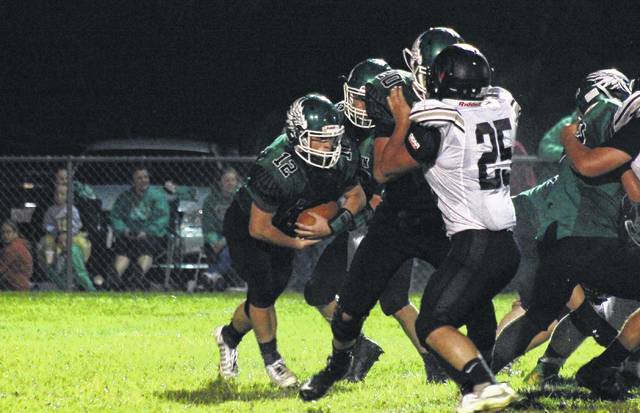 Last Week: Green defeated Hannan 12-0, in Franklin Furnace; Eastern lost to Miller 30-0, in Hemlock. EHS offense last week: 39 rushing yards, 14 passing yards. GHS offense last week: (-4) rushing yards, 17 passing yards. EHS offensive leaders last week: QB Nate Durst 1-7-2, 14 yards; RB Sharp Facemyer 2 carries, 13 yards. GHS offensive leaders last week: N/A. EHS defense last week: 253 rushing yards, 35 passing yards. GHS defense last week: (-32) rushing yards, 109 passing yards. 1. Eastern’s last trip to Franklin Furnace was 2004, with the Eagles pulling out a 25-18 win in overtime. EHS lost its first road game of 2017, giving the Eagles are a combined 7-9 on the road in head coach Pat Newland’s current tenure. 2. Green’s last win over a TVC Hocking school was September 8, 2006, when GHS beat Miller by a 30-14 final. The Bobcats defeated Eastern 37-12 the previous season. 3. Green’s opening game of 2017 does not count toward its standing in Region 27, as the Bobcats faced West Union, a club team. West Union defeated GHS 46-14. 4. Last week, the Bobcats were even in the turnover battle, fumbling twice, while recovering two Hannan fumbles. Green’s lead was just 6-0 headed into the fourth quarter, but the Bobcats returned a fumble for a touchdown to gain a little breathing room. 5. Eastern is still trying to find the endzone, as the Eagles have been held scoreless through two weeks of play. Meanwhile, the Eagles have allowed nine touchdowns this fall, six rushing and three passing. Eastern junior Blaise Facemyer (12) takes a handoff from quarterback Nate Durst, behind a block from Mason Dishong (20) during the Eagles’ Week 1 loss to River Valley, in Tuppers Plains on August 25.